It is only in the last year or so that I have had the luxury of a room dedicated entirely to my life as a writer. Three of my five novels to date, plus a couple of others that have been shelved, were written on the kitchen table, my lap, or in the car while waiting for one or other of my children. The last two novels in the Skywatchers series were written in my office, that at the time also functioned as a preparation and marking space for my work as a school teacher, and as a place for one-to-one tuition. Nevertheless, planning how I would set up my writing room not only informed the choices I made when this dream became a reality, but also enabled me to replicate some of the elements I would incorporate in this room, albeit in a more restricted form, into earlier, more multi-purpose spaces. Surrounding myself with these aids has supported the development of my sense of self as a writer, has boosted my productivity, and has helped to define the path that I have taken in this field. I very early realised that I would need visual aids to keep track of all the threads that needed to be interwoven to create Brightly Shines the Darkness, the first book in the Skywatchers series. For example, by starting the story at a seminal moment – a summer solstice day that was immediately followed by the night of a full moon – I rooted the book to a time thread. Although the events take place at some unspecified time in the distant past, and in an imaginary location, I wanted to avoid the type of inconsistency where, for example, the characters look up at a crescent moon four weeks after this starting moment, or where the winter solstice took place at an inappropriate time in the lunar cycle. To start with, I made my own calendar combining lunar and solar elements. By the time I was writing the third book, and editing the first, I had discovered that this work had already been done, that it was possible to buy such a calendar. All I then needed to do was to find a (modern) year in which the night of a full moon followed the day of the summer solstice, and thus 2002 became the type-year upon which the relative timescales of the series were based. One of the first decisions I made regarding my dream office, therefore, was that I wanted at least one pinboard on the wall, on which I could hang the calendar holding the lunar and solar points for the type-year my imaginary world had reached. And because one can fantasise on any scale one likes, I then decided that I would prefer to have a great deal of wall space, that I would surround myself with all the charts, diagrams, coloured timelines, and village layout sketches that I had created to keep my world and plot arcs consistent. Although it was not possible to create these boards at that time, deciding that I wanted them did cause me to modify my environment in a way that supported my writing. Up until that moment, I had stored all these prompts and aids in a folder, tidied away except while I was actually writing, when they tended to get spread all over the table next to my working space. Once I wished I could have them up on the walls in easy view, I found that I could Blu-tack the most vital of them to the inside of the wall cupboards in my kitchen. By opening these when I was free to write, I could look up at them, with the added advantages that this was much quicker than rummaging through the file, and that each diagram stayed in the same place until I no longer needed it. As I was writing at the kitchen table, this enabled me to create some semblance of a dedicated writing space in just a few seconds. I expect you get the idea. Knowing what you would ideally like helps you to make small changes that bring forward some of the benefits of that ideal, and keeps your goal in the forefront of your mind, where it is more likely to become a priority. Additionally, planning the ideal environment for “when” you have a dedicated writing space helps to set it in your mind as a future certainty, rather than a possibility that will probably never be realised. Now that my office is just for writing in, I have very little furniture there, apart from two desks and two bookcases. One of the desks is at just the right height for typing, and I have a dining chair and a balance ball to sit on, alternating my writing time between them. The other desk is much larger – too high to sit at for long, but the perfect height for standing at. I use it mostly for organising things – creating index cards and shuffling them about when I’m planning orders of events or journeys, sketching maps and timescales, and preparing visual aids to act as prompts for the next section, chapter or story. 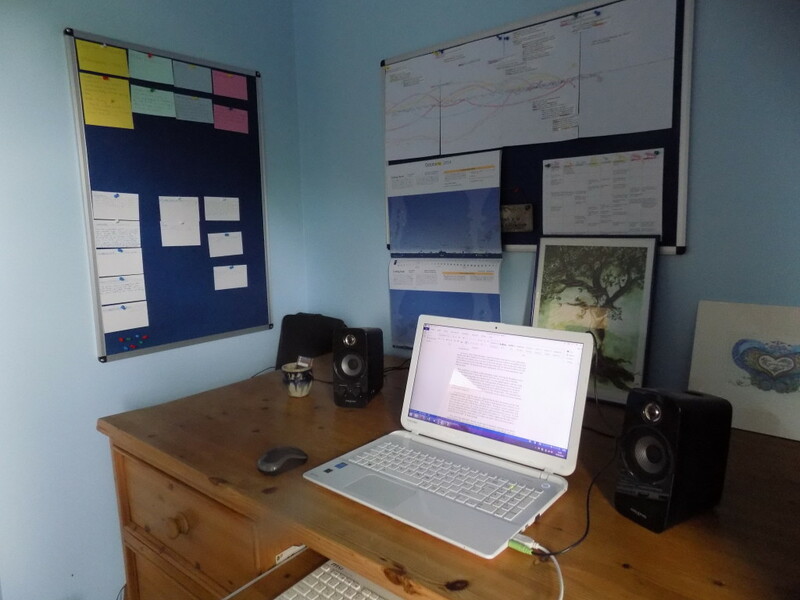 I also use it, with a plug-in keyboard on a lower shelf, for research, as I can have books, pads or notes spread out while I’m working. Because it’s high, wide, and deep, it has a huge amount of drawer space, into which I can fit all my stationary, rolled up maps and plans from earlier books, prompts, pictures and diagrams that I will use again some day, and even advance Christmas and birthday presents for my husband! The bookcases are full of books, mostly: books about writing, books that help me situate my writing within a time and place, and books I have used for research. There is also a box file for each of my Skywatcher novels, containing research notes and other preparatory work, plus drafts of two early, unrelated books, which I may revisit one day – I still think that each contains a good idea, but they would need completely rewriting. But the working and storage spaces, although highly practical, are not what most makes this my own space. Most of all, I appreciate the pinboards – see my earlier post, Writer’s Guilt, for details of how I now use these. Next, I love the outlooks. Standing at my big research desk, I am facing into an alcove with pinboards on all the walls, so I am surrounded by my own writing prompts. I can sit at either the front or the back of the smaller desk, so I can face into the room, or out of the window and over a magnificent view of the valley in front of our house, with Ashdown Forest in the background. Along the back of the bigger desk, below the pinboards, are ranged pictures and prints, mostly by local artists, that reflect the subject matter or mood of a current writing project, or support my writing in some other way. How would you design your ideal writing space? What would it contain to support and inspire you?